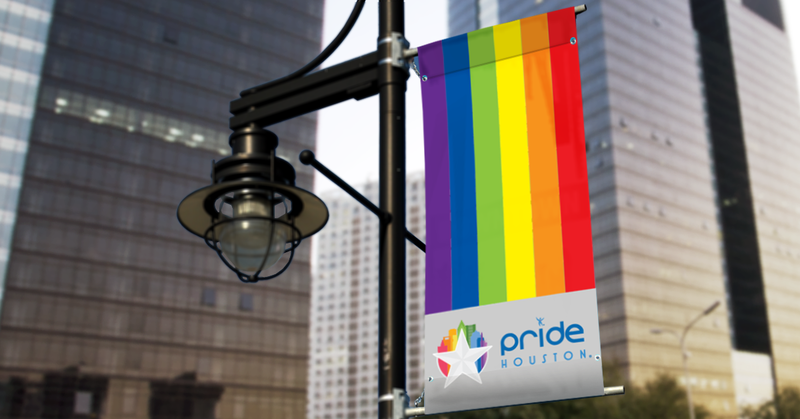 Pride Houston® Banners to Fly Downtown: A Houston First – Pride Houston, Inc.
For the first time ever, the rainbow banners that once hung for decades on Westheimer in the Montrose District will now be proudly displayed in Downtown Houston during the month of June. Pride Houston® will have 32 sets of banners along the 2017 Houston LGBT Pride Parade® route on Smith and Milam streets from Rusk to Clay intersections. This new tradition comes after a revision of regulations from the banner district left the historic LGBT banners out of compliance in Montrose. In hopes of continuing the tradition of the Westheimer banner alive, the Pride Houston Board of Directors voted to print the rainbow banners along the route of the Houston LGBT Pride Parade® in Downtown Houston. Additionally, the Board voted to pursue a permanent banner district along Westheimer in the Montrose neighborhood in an effort to commemorate the history of the area and showcase the community and culture it represents. Pride Houston is currently seeking a solution with the City of Houston, the Montrose Management District, and Centerpoint Energy to make this banner district along Westheimer a permanent reality. In the meantime, the organization will be accepting donations to support the return of the rainbow banners to Westheimer. While the banners will still primarily remain the traditional rainbow design which has long represented the LGBT-oriented community as a whole, Pride Houston® will work with the banner district(s) to incorporate different designs throughout the year. This effort by Pride Houston® is intended to showcase the diversity of the Houston LGBT community and its historic center in the Montrose neighborhood.